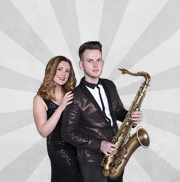 The established professional function duo of The Lady and The Sax feature the sensational vocals of Miss Chloe Barry, together with the superb saxophone, harmonica and vocal talents of Sam Pagett – an entertainer who oozes talent and charisma! This unique duo provides top-quality entertainment for functions, parties, venues, corporate events and weddings throughout the UK, bringing youth and vitality to classic Rock and Roll, Swing, Blues and Jazz/Pop music from the 1950’s to present day. Professional, good fun and very entertaining, The Lady and The Sax deliver a performance with unrivalled personality and passion that will suit a wide range of ages and tastes and are sure to get audiences singing and dancing along. The duo performs with professional backing tracks, so you get the sound and quality of a full band, but without the added expense. 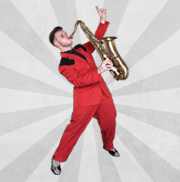 And, as a professional sound and lighting engineer Sam Pagett ensures that The Lady and The Sax make just the right impact with the sound, lighting and effects to create the best party atmosphere for your venue - no matter how large or small. So if you’re looking for stand-out up-beat entertainment for your event then you can be sure The Lady and The Sax will bring the party! The Lady & The Sax will bring talent and energy that gets everyone a rockin’ and a rollin’! Quality entertainment that puts the ‘fun’ into fundraiser and has your audience calling for more! Looking for a party and not just entertainment? We bring all the singing, dancing and fun! Enjoy a fun-filled cabaret-style show with our Trio option that is hugely entertaining! Contact us to discuss your function requirements and check availability for The Lady and The Sax. We hope to have answered the most frequently asked queries about booking The Lady and The Sax on our Booking Information page, but if you have any other queries please get in touch. Saxophone & Harmonica Playing That'll Leave You Speechless! Sound & Quality of a Full Band; Without The Expense! Optional Disco To Keep The Party Going!